Take a 3D object created in Cinema 4D Lite, add it to an After Effects project, create and animate new effects elements, and add 3D type, audio, and lights to produce a 30-second title sequence. In this video, you’ll walk through an example that covers a wide variety of skills you can apply to your future project. By the end of this video, you will be able to import an existing 3D object, create 3D type, use multiple effects, add layers, and synch music to create a compelling animation sequence. Along the way you’ll see the process of creating this sequence from start to finish in After Effects/Cinema 4D Lite. You’ll employ effects layers, masking, tracking, keyframing, plug-ins, and 3D type with TypeKit fonts. This video includes a detailed step-by-step explanation of every aspect involved in the making of the final sequence. Intermediate users of After Effects/Cinema 4D Lite and Photoshop. 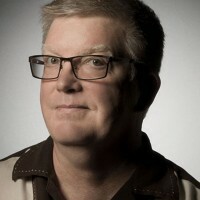 Jeff Shaffer has been a freelance commercial photographer and video producer for more than 25 years, and has taught at the School of Visual Arts in New York City, and a number of software training companies as an Adobe Certified Instructor, both online and on-site. In that capacity, Jeff regularly travels around the United States for corporate, government, and media company training sessions. Jeff also has a number of instructional videos and other video projects on his Vimeo page. Welcome to animating and creating 3D objects in After Effects. Hi, I’m Jeff Schafer. I’m an Adobe certified instructor, commercial photographer, and video producer. I’ve taught at the graduate program and digital photography at the School of Visual Arts in New York City and I conduct regular training sessions in Photoshop, After Effects, and Premiere Pro, both online and on site for a number of training companies in the US. Here are some links to my work. Feel free to contact me anytime via email, jeff@towerabovestudio.com. This intermediate level course will help you develop more essential skills in Cinema 4D Lite and After Effects. You’ll learn how to add a Cinema 4D Lite object to an After Effects project, create new effects layers in After Effects, keyframing and basic animation principles, motion path and easing, create a 3D type object in After Effects, synchronize a music track to animation key frames in After Effects. This series of videos demonstrates creating effects layers, masking, tracking, key framing, using a plug-in, and creating 3D type with type kit fonts. Included are detailed step by step explanations of every aspect involved in the making of the final sequence. I think you will find this course both informative and entertaining and I hope it will inspire you to create some great work of your own. Let’s get started.